Where can I fly my UAV? The Civil Aviation Rules prohibit a UAV being operated within a 4km radius from any uncontrolled aerodrome unless you meet the requirements of a shielded operation (see above). The rules also restrict operations at other specially designated areas, some of which are permanent and others notified daily by Notices to Airmen (NOTAM) distributed by Airways. These can be found on IFIS under Briefing (Area or Specific). Airspace dimensions, certificated aerodromes and designated areas can be found on Visual Navigation Charts (VNC) available for purchase here. In addition, you must avoid operating over people or property without prior consent. Check out the AirShare property owner consent list here. When can I fly my UAV? You must keep your UAV below 400FT Above Ground Level (AGL) except if meeting specific conditions in the Civil Aviation Rules. If you wonder why we are talking in feet, it is because the aviation industry measures height in feet. 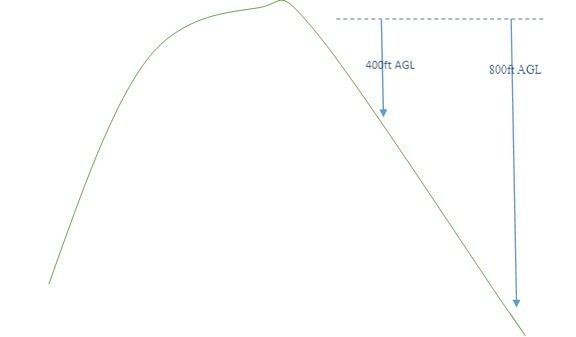 If you fly away from the slope, the height AGL of your UAV may increase rapidly. It is your responsibility to ensure you remain at or below the height authorised in your approval, at all times. 1. If your UAV is over 25kg maximum weight you will need to hold a Part 102 Unmanned Aircraft Operator Certificate. 2. If your UAV is 25kg or under your operation is governed by Civil Aviation Rule Part 101 unless you hold a Part 102 Unmanned Aircraft Operator Certificate. Over any active movement area or runway and not above 400ft AGL (above ground level) within 4km of an uncontrolled aerodrome without CAA approval and an observer on site. Within 4km of any aerodrome, unless under the direct supervision of the holder of a pilot license, approved person or organisation, or instructor qualification issued by Model Flying NZ (MFNZ). You should also make yourself aware of potentially hazardous areas. Please check the AIP (under the Permanent and Temporary Airspace links) to find out where these areas are. The Airways National Briefing Office can supply the latest NOTAMs (Notice To Airmen) and other information pertaining to routes or areas on the day of operation. These can be found on IFIS under Briefing (Area or Specific). CAA is the regulator of UAV operations in New Zealand. Please contact them to find out whether your operation falls under the rule framework and for advice on how to plan a safe, legal operation. Call the CAA on 04 560 9400, or email at rpas@caa.govt.nz.